There’s a Boil Water alert for all of Portland today. Who wants to get sick on the verge of Memorial Day Weekend? So I take this stuff seriously. But, really, who wants to go to all of the trouble to boil water just because we are thirsty? (Ok, bratty US resident coming out.) Even still, what is something quick and chilly (not boiling) that I can drink now, at noon on a Friday? Club Apple! Over ice, pour the cider and soda. (I still have homemade cider around.) 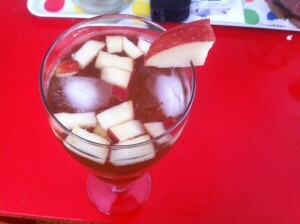 Top with apple bits for a refreshing (no need to boil!) daytime drink! Minimal sugar and happy-ness involved! Happy weekend! Many thanks to all those that sacrificed everything so that I have the freedom to speak, blog, love, dream and worship here, in this beautiful land. Happy Memorial Day. Holy moley, where have you been!? I’ve been around, but just not here. 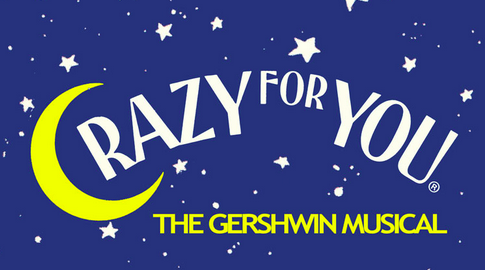 And I have a fun little 10:00pm guilt-free treat for you! 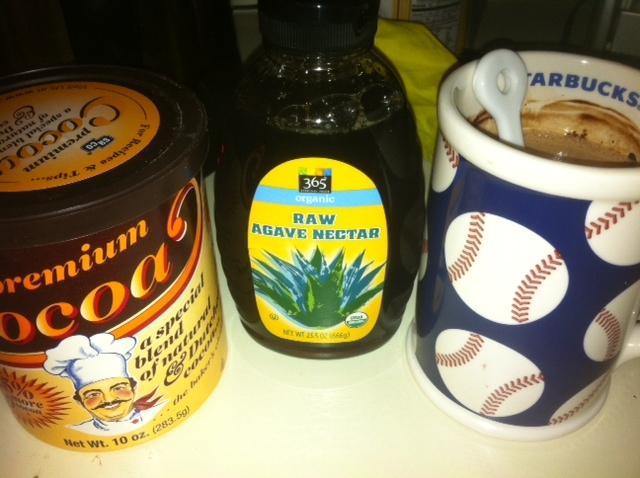 80 calorie cocoa or hot chocolate, however you prefer to name it. Yes, it’s for real. Here goes. not too sweet, not too chocolaty. it’s warm, frothy, and perfect for a moment when all you want to do is devour that bag of chocolate chips in your pantry. breathe and enjoy. Heat the milk until nearly boiling…until hot, yes. Whisk in cocoa and syrup until blended. Sip and smile. This is not some trick to make you run through your nearby mall’s Cheesecake Factory, blindfold yourself, and NOT watch yourself downing one of their 4-serving cheesecake slices. I think Heaven might be filled with guilt-free cheesecake and lots of fried tortilla chips and queso. Swimming pools of queso. But I digress. Endless flavors…plain is delightful, and so is mocha-choco-lala, too. The word “cheesecake” spoken aloud ensues “oos and ahhs” from anyone nearby, even strangers. Especially strangers. Heavy and filling. It’s no fluffy macaroon in that way. Decadent, rich, everything that breaks all healthy rules. Until now. Now I’m not going to pretend that this is the cheesecake you have on your birthday (and eat all of the leftovers over the 2 days after your bday…no judgment). But it’s guilt-free and satisfies the creamy, sweet, graham cracker-type craving you might have been missing. And it’s quick and easy and lowfat and light on sugar. Step 1: In a small bowl, combine cheese and sweetener until creamy. Top with fruit or jam. Add graham crackers to the side. 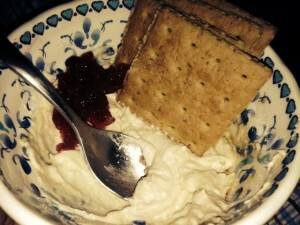 Dip graham crackers into filling.